Whether it’s Ohio transmission line construction, movement, or associated logistics, operations often prove laborious and lengthy. Given the need for precise procedures, why not trust an industry professional with the complete extent of the undertaking? Discover unrivaled transmission line insight with helicopter-facilitated operations, ideal for scaling your ventures. Leave a helicopter authority in charge of your transmission line construction requirements, for streamlined, dependable success every time. Associated helicopter pilots are rigorously trained and certified, and are uniquely capable of providing your operations with both peace of mind and a job well done. Welcome to the expansive American Midwest, home to so much of the critical lands that support the national economy. Ohio is rightfully known as The Heart of It All, in direct reference to its geographical situation. Supported by largely flat landscapes and bolstered by extensive periods of yearly weather well conducive to flight, Ohio serves as an ideal location for transmission line constructions by helicopter. With more than 7,000 miles of transmission lines, Ohio serves as prime territory for transmission line construction by helicopter. Optimize your Ohio transmission line construction operations through the air. Our agents can easily arrange for transmission line constructions by helicopter, optimized procedures to further your ventures. Lend professional air support to your transmission line agenda, thanks to an ideal helicopter operator. Accomplish your projects according to your exact specifications. Additionally, helicopter providers can organize logistical transport of crews and supplies to offshore destinations and high-altitude locations alike. No matter the size or the shape of the load, a helicopter can quickly and efficiently reach your final destination, cargo in tow. Expedite extremely heavy lifts and external loads with a simplicity unique to helicopter prowess, with the provision of an aircraft. No matter the length, stringing of wire meets a worthy solution by helicopter. 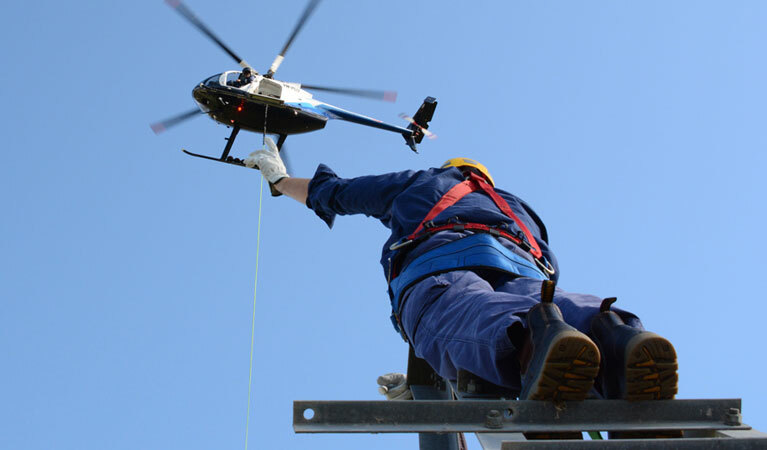 String wire safely and securely from one destination to another, with an effectiveness exclusively available to dedicated helicopter providers in the region. Wire stringing requires precise, executive oversight, elements that define helicopter reliability. Install utility poles on the premises with unrivaled ease, when you add the vertical element to your endeavors. Installation of utility poles in Ohio is finally provided with the worthy industry solution, facilitated by intensively trained helicopter operators looking to optimize your operational output. Fulfill the extent of your ROW and site inspection needs by helicopter, to provide yourself with a holistic perspective of the entire site. Whether you’re touring the transmission line location with the crew, or identifying regions of particular interest, site inspection is made painless with the introduction of helicopter assistance. 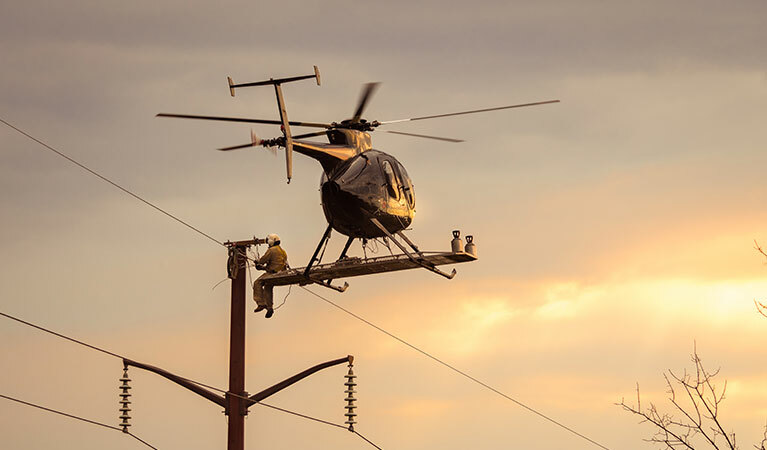 Discover the ability to transport both work crews and assorted supplies with unparalleled speed and safely, uniquely with the installation of a helicopter to your transmission line work site. Logistical transport can transform transmission line constructions; watch your outlook improve with the introduction of aircraft-completed operations. Experts are standing by to get you a fast quote for your transmission line job in Ohio! Contact one of our dedicated customer service agents, for the answer to all of your questions, and to begin booking a Ohio transmission line construction helicopter package. Your Ohio transmission line construction needs are solved from above. Or, fill out a customer contact form, and expect a response within 24 hours.